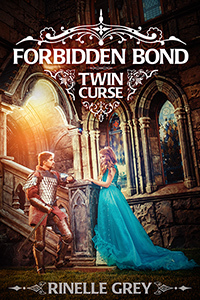 Brianna has never questioned the ancient law that requires her to marry the same man as her twin sister—until her sister falls in love with gentle and obedient Terion. Despite knowing he’s perfect for her sister, Brianna can’t bring herself to care for him, but unless she agrees to the marriage, her sister can’t marry either. In a desperate attempt to allow them both to live the life they want, Brianna fakes her own death and runs away. She knows she can never marry another, but she can live with that. What she hadn’t counted on was meeting Lyall, a handsome but mysterious man visiting the inn where she works. A powerful mage and heir to the throne of Isla de Magi, Lyall could have his pick of women, but it’s not until he meets a simple serving woman while on a covert mission to the mainland, that he loses his heart. First fascinated by the raw magical power he senses in her, then by her forthright and honest nature, Lyall is smitten. He can’t understand why she keeps her distance, or why she refuses to talk about her past, but he is sure he can win her over. As their love blossoms, and a fierce enemy threatens her home village, Brianna begins to discover more about the origins of the ancient law, and what happened to the last set of twins who broke it. Can she escape the curse, or will she have to choose between her love for Lyall, and the safety and happiness of her sister?